Last year’s Villanova seniors were one of the most successful classes in college basketball history. They collected a National Championship, multiple conference titles, and swept the Big 5 in their time on the Main Line. Kris Jenkins contributed for three years, peaking with one of the biggest shots in basketball history. Daryl Reynolds was a solid big man for Jay Wright’s guard heavy attack. Josh Hart will be missed more than nearly any player in the nation. He did absolutely everything for Villanova in his last four seasons. Hart scored when he needed to, created for others, rebounded exceptionally well for his position, and defended his brains out. Every single aspect of Hart’s game will need to be replicated by those now filling his shoes. 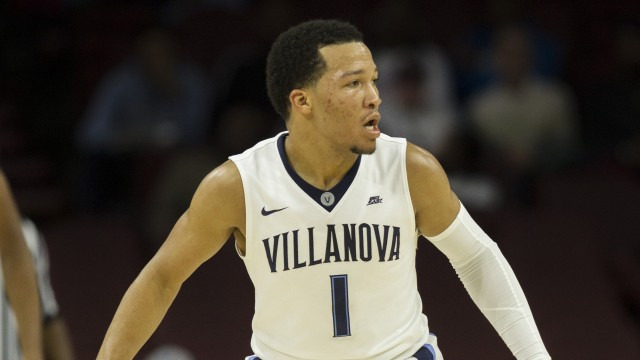 Jalen Brunson will lead the efforts in replacing Hart. He’s poised to lead the Wildcats in scoring and run Jay Wright’s offense. He’s an average athlete at best, so with every game under his belt, his basketball IQ grows and Brunson becomes more and more effective. Villanova’s hopes for a deep run in March (or into April) may rest on the difference in Brunson being a good player and being the best point guard in the nation. Brunson is joined by Mikal Bridges, who will more directly fill in for Hart. The rangy small forward can do a ton in Jay Wright’s system. He can attack the basket and help the Wildcats convert turnovers into opportunities on offense. He’ll become a true weapon for Villanova if he can continue to make outside shots. Bridges raised his 3-point percentage by 10 points between his first two seasons. His ability to stretch the defense and attract attention all the way to the arc will make him a more effective slasher and scorer as well. Donte DiVencenzo’s development last season was crucial for Villanova. He evolved from a liability on the offensive end into a problem on the defensive scouting report. In Villanova’s first 23 games, “The Big Ragu” scored just 7.0 points per game on 30.4 percent outside shooting. In Villanova’s final 13 games, he topped 15 points six times and shot 45.7 percent from long range. If DiVencenzo can play like he did down the stretch last season, Jay Wright can expect a lot more from his entire offense. Phil Booth, forgotten after a season lost to injury, returns to the lineup. He’s a capable scorer in a pinch, but will be most valuable as a defender. His ability to cover the best opposing guard will allow Brunson to focus on the offensive end. Eric Paschall is a do-everything man in the paint for Villanova, even if undersized for Big East play. The big addition here is redshirt freshman Omari Spellman. He was ruled academically ineligible by the NCAA at the last minute before the 2016-17 season, after impressing in early practices and scrimmages. Spellman is a 6’9, 245 pound monster in the middle. Jay Wright is not known for his work with big men, but Spellman could be the first to truly pop as a Wildcat. He’s super talented and could have changed Villanova’s fate last season. Swingman Jermaine Samuels is Nova’s top ranked incoming true freshman, though we’ll also hear from local product Collin Gillespie. If not for Ryan Arcidiacono’s presence on the Chicago Bulls roster, I’d want a DNA test to prove Gillespie isn’t just Archie in disguise. KenPom’s preseason rankings lean towards returning players and success in recent years. No surprise then to see the Wildcats on top. I think human polls will want to see Spellman before really believing in Villanova as a title contender. How about one of the weirdest six game stretches you’ll ever see? Villanova will play their only on-campus home game at tiny Jake Nevin Fieldhouse against Penn on November 29. The Wildcats will then play their second closest game to campus, in enemy territory at hated rival St. Joseph’s (Not to mention, for the first time in years, the Hawks are poised to make a game of the Holy War). Villanova then heads up I-95 for a showdown with Gonzaga at Madison Square Garden on December 5. Next up, the Cats head back to their surrogate home in South Philly for a rare Big 5 game at the Wells Fargo Center against LaSalle (I’m actively searching for good reasons this isn’t a Palestra game). Villanova then plays at Temple in another heated rivalry game. Then the Wildcats finish the wild stretch with a “home” game against Jay Wright’s former home, against Hofstra on Long Island. It’s a weird schedule from start to finish.